I would like to narrate an extraordinary incident happened few days ago. Brother B.Srinivas from Puttaparthy has informed me that, they have identified a deserving case to be taken up for medical treatment for cancer, at Hyderabad . One Smt. Narasamma aged nearly 70, a resident of Venkatareddy palli near penugonda, was certified by the doctors (after conducting the necessary tests) at Anathapur that, she was suffering with Uterus cancer and to be sent for treatment to the Indo American cancer Hospital Hyderabad. Immediately Brother BS called up and said that, they are sending her with three of her family members, by the night train and they would be at Hyderabad by 5 A.M on Saturday, the 9th of Jan.2009. He wanted me to take care take care of their stay arrangements at Hyderabad and wanted me to show her at Indo American Cancer Hospital for treatment. As she had the coverage under Arogyasree of A.P. State medical Scheme, there was no necessity of spending any amount either for the tests or for the proposed treatment. The next day four of them have landed in the morning and I arranged their stay at Hotel Nataraj, which is near Kacheguda station. Brother Indraneil Benerjee, who traveled along with coordinated in bringing them to the hotel and leaving them. Next day being Sunday, I could not arrange for the check up/treatment. In the meantime, with the permission of the competent authorities at Sivam I have shifted her from the Hotel accommodation to the Premises of Sivam, as I felt that, she would have the divine vibrations, which may give her some positive vibrations for getting relieved of the pain, which she was suffering. On Monday morning, she was taken to the Hospital for treatment. Dr.Narsimham garu of Puttaparthy has helped us by contacting the known doctors over there and directed us to meet them for treatment. On 12th Morning, tests were conducted for the patient and the lady doctor there expressed with Mr. Raghunath, the son of Smt.Narsamma, that her condition is very bad and she doen't want it to be disclosed to the patient, as she may get disturbed mentally. In fact Mr.Raghu shared this information with me and felt very sad. Doctors have asked MR.Raghunath to come for the reports on the next working day, i.e. on 15th of Jan 2009, as Bogi and Sankranthi festivals have fallen on 13th and 14th of January 2009. In the meanwhile, they have stayed in Sivam and attended the special programmes too. 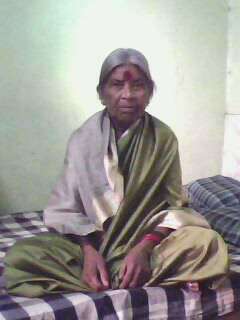 On 13th night Smt.Narsamma had a dream at about 4A.M. in the morning, and she said Bhagavan appeared to her and applied vibhudi on her stomach and rubbed it with force. Later Swami assured to take care of her. She had narrated this to me when I went to visit them that night. Because I had heard the doctors version through her son the before day, I half heartedly consoled her, saying nothing would happen as Bhagavan has assured and treated her in His divine way. At that point of time, I never knew that this is going to be a reality. In fact this I shared with my brother and some of my collogues that her condition as per doctor is critical and I only pray Bhagavan to make her dream come true. Thursday when the reports have come, to our utter disbelief, doctors have confirmed that the reports have not revealed any malignancy. However they wanted the patient to undergo biopsy too to rule out even an iota of doubt. Hence, on Saturday, ie 17 Jan we took her again to the Hospital and got her biopsy done as per the doctor's advice. Now the faith on the divine healing has increased in all of us to the extent of 90%, as Bhagavan always says, we are all doubting Thomases'. This is the reason precisely, I waited till today for the biopsy reports too to come and after it is established once again that there is no problem of cancer, I am venturing to share with you the lovely Miracle of Bhagavan, which has cancelled the Cancer of Smt. Narasamma, a humble devotee of the Lord. 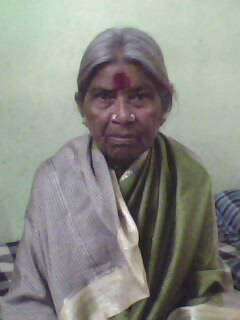 In fact, the day they were leaving for their village on Saturday evening, I took two Photographs of Smt. Narasamma, which I attach for you to just see. It has been our experience that whenever, His students have taken up an activity, His divine play was always there taking care with the love of thousand mothers.